Bing Satellites - Landscape and Drift - BFW recordings netlabel - ambient shoegaze indie experimental electronica - music is free! 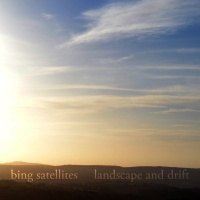 Prolific ambient musician Bing Satellites returns with an album of slow, drifting ambient music. I played a few soothing tunes on the piano (well, my facsimile of a piano) from time to time, but it came as quite a surprise to find that all of this music had been recorded during that week.